The complete guidebook to make Quick Cash when YOU need it most. 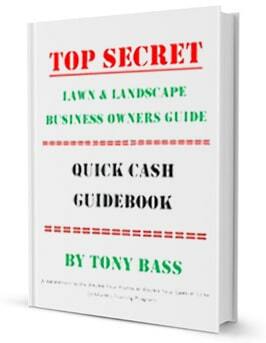 These advanced techniques have been used by business owners across America to raise their bank accounts to high five and six figure balances while leveraging internal an external assets that are typically overlooked an underutilized in lawn and landscaping companies. If you can take on 10, 20, 50, or more lawns in 2016 that's good news! If you are spending money on Homeadvisor, Angie's List, SEO, online ads, offline ads, TV, radio, or direct mail... PLEASE - PLEASE - PLEASE...Make sure you start using these NO COST marketing strategies in 2016. 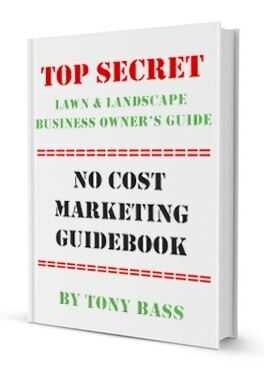 The NO COST Marketing Guidebook is a MUST! Paid Access Webinars-Click the blue button to register for Tony’s most recent webinar or click “Learn Now!” in the menu above to choose from a variety of hot topics. Send us an email. Complete this form and we’ll get your FREE business plan right over to you. YOUR PRIVACY: Super Lawn Technologies maintains a high level of confidentiality. We do not share information with any other organization and will treat clients’ personal information with care. Thank you for co-authoring one of the BEST books I have ever been privileged to teach with. I use The E-Myth Landscape Contractor as the foundation for my senior course “Landscape Management Systems”, and require students to include multiple concepts from your book in developing their business plans. Your insights and wisdom are profoundly beneficial. Thanks again Tony, and God bless you in continuing to inspire all in our industry to become the best we can! Tony Bass talks with Michael Gerber. Watch HERE! WOW! After many years of only existing in the landscape industry with no sales efforts, only worrying about, "What if I lose this account?" …my experience has been when I lose an account, another usually takes its place. So, I don't usually stress too much. I now know that if I want my company to reach the potential that I know its capable of, I will need to put forth the effort in sales. Tony, I am looking forward to our working relationship as well as whats to come in the future! Third, On my wall in my office I now have a Close Ratio sheet where I write in the customers name, type of job and I put a check mark next to every job that I close on. It is very motivational when I get to make another check mark for another job sold! Last, I have made it a policy to write an estimate on the spot for all residential maintenance contracts and any install job that is under $5k. People have been very surprised after we take a look at the job they want done and I tell them to give me about 20 minutes and I will have a contract ready. I take my pre made estimating sheets and my laptop with my bass spreadsheets with me in the truck so I can get this done. I have won every single job so far in which I have used this tactic! Thanks so much Tony! This stuff really works and I feel I have a tremendous advantage on my competitors. "I just wanted to say thank you again. I appreciate the education, insight and motivation to help me grow my business. As soon as I got back I prioritized a few of things that can change immediately and reached out to my insurance agent and payroll company to set up meetings to review. I should be able to save a little bit of money right away. The feedback and conversations with the other company owners, employees and spouses that were there has made me realize just how many great people are in this industry. Next time I come down though I think I will fly!" "I just wanted to thank Tabitha and Tony for everything this weekend (at Profit Builder). Both Jason and I had a great time and we both felt we learned quite a bit. We look forward to spending more time with you guys in the future." "Thanks for doing these amazing webinars, I greatly appreciate it. In the last one I watched, you mentioned that you would send out (your) book...I am really looking forward to it! Again, thanks so much for all you do in the landscape industry, you are truly setting the standard. " 1) I think we’re doing good. We are on budget and booked 43 hours per week with 6 crews. 2) Allowing my staff to do everything instead of me and deciding what is the next move for LM to continue growth.